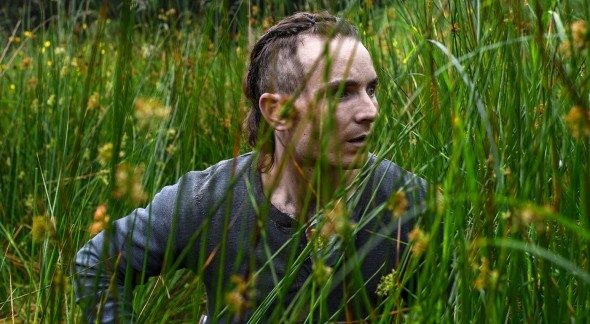 Lean, mean futuristic science fiction that feels unsettlingly like reality, The Survivalist ranks among the best dystopian films in recent memory. And as writer/director Stephen Fingleton creates an utterly plausible and devastatingly grim future, the film marks a first time filmmaker with an awful lot to say. A solitary figure (Martin McCann – amazing) ekes out an existence in a shack hidden in the woods of Northern Ireland. His small field of crops is fertilized by the bodies of interlopers who happen upon him. He spends his days tending his vegetables and reinforcing his traps, but a haunted past and his own isolation are starting to wear at him. Enter two hungry women: Kathryn (Olwen Fouere) and her daughter, Milja (Mia Goth). His first inclination is to do with them what we’ve seen him do with others who come too close to his holdout. But he’s tempted, made an offer for something not necessary for survival. Something he wants more than he needs. For Milja and her mother, this is still nothing more than survival, which is what puts the three people on different planes of existence. The survivalist (for we never do know his name) has entered the treacherous and vulnerable area of want, and then the even more dangerous ground of hope. The shifting power and landscape of the relationships is fascinating, made all the more powerful for lack of dialog. Who is in control? The answer varies scene by scene. The title could stand for any of the three, and this trio of performances consistently impresses. Fingleton lingers on glances and body language to reinforce the pitiless practicality that has taken the place of civilization. McCann’s silent chemistry with each character offers more insight into his character than pages of dialog could, and he’s matched in his efforts – particularly by Fouere. The film, like its protagonists, is unapologetically efficient. But Fingleton and his director of photography Damien Elliott occasionally offer a glimpse of the beauty left in this dystopia – a beauty that existed long before and will persist long after man’s involvement. Together, cast and crew trap you in slow-boil of primal instincts with an explosion the inevitable consequence.